You got to understand how important is to attend this tv show, because in this skill game you'll be there to protect the journalist from this zombie invasion over the news channel. Take your mission seriously and learn how to throw ammunition into the zombies to get rid of them forever. 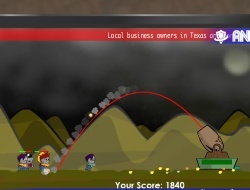 It's all about the technique you approach and the idea of this zombie game is to react before they do, so aim your cannon and be ready to shot some dead creatures. But you have to be careful because they attack from two different sides, that's why you need to flip the part anytime you think the danger is near. Fix your trajectory and discover the perfect angle to eliminate all of the attackers while the tv channel remains intact. During the game you'll be able to reach other levels that will unlock once you annihilate the threats. Do your best and remember everyone is counting on you to save the day. Use the arrow keys to play, left and right to move your direction and up to hit. Zom-Tv 0.00 between 0 and 10 based on 0 votes.